이구아수 국립공원 입구에서 400m 떨어진 곳에 위치한 4성급 San Martin Resort & Spa에서 각종 레저 활동을 즐겨 보십시오. 숙소는 이구아수 폭포 인근의 자연 경관을 자랑합니다. 유료로 이용 가능한 스파에서 사우나, 온수 욕조, 마사지 서비스, 휴식 공간을 이용해보십시오. San Martin Resort & Spa에는 정원으로 둘러싸인 대형 수영장이 마련되어 있습니다. 주변 자연림 내에 있는 생태 하이킹 코스 및 배구, 축구, 테니스 등을 즐길 수 있는 다양한 스포츠 시설도 이용 가능합니다. 조식은 06:30~10:30에 제공됩니다. 늦은 밤까지 운영되는 Tarobá Restaurant에서는 세계 각국의 특선 요리를 선보입니다. 11:00~00:00에 운영되는 아늑한 분위기의 Lapacho Video Bar에서 음악을 감상하며 휴식을 즐겨 보십시오. 숙소에서 1.5km 거리에는 포즈 두 이구아수 국제공항이, 도보 4분 거리에는 조류공원이 있습니다. 포즈 두 이구아수 국제공항에 도착하는 경우에만 무료 교통편 서비스 이용이 가능합니다. 해당 서비스를 이용하려면 체크인 최대 48시간 전에 미리 요청해야 하며, 항공편 정보를 숙소에 제공해야 합니다. 돌아오는 교통편은 유료로 이용 가능합니다. 최고급호텔을 생각하면 실망하겠지만 어차피 투어가 목적이라면 이 정도면 충분. 방이 아주좁고 의자.거울.욕조..등 부족. 가장 안 좋은점은 저녁부페가 60헤알이나 하면서 먹을게 별로 없다는 사실. 다른식당도 근처에 없어 어쩔수없이 호텔식당이용할수 밖에 없음. 무료로 제공되는 아침식사는 훨씬 훌륭합니다.로비도 좋은편입니다. 와이파이가 되다가 안되다가 합니다. 편리함 1.호텔에서 iguasu 국립공원(브라질쪽)까지 걸어서 6-7분 정도밖에 안걸림 2.iguasu 공항에서 sam martin호텔까지 차로 10분이내로 교통이 편리 3.호텔 예약시 pickup 서비스 요청경우 무료이용 4.iguasu폭포(브라질 사이즈 및 아르헨티나 사이드)관광시 호텔내 여행사를이용하면 편리하게 다녀올 수 있음 5.비행기 출발이 늦어 호텔측에 요청하여 late checkout을 가능하게 해줌. 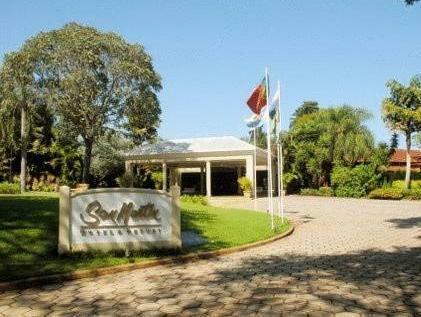 This hotel is very close to the entrance of Iguazu Falls. The rooms could definitely use some updating/renovation. It was a short one night trip to San Martin but wow was I blown away by the facilities and the staff. Everyone from the front desk, to housekeeping, bar tenders, pool attendants and cooks were impeccable. My cousin and I had the best time! A million thanks to everyone at the San Martin for such a pleasant stay! One last note, the resort is situated next to the parque das aves, so the birds can be heard from the pool area and get quiet noisy but we didn't mind it. It added another layer to the jungle experience of the resort. Will definitely return next time I come to the waterfalls! It literally is steps away from the entrance! 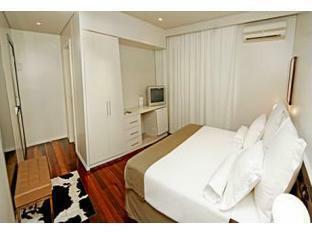 Location in walking distance from Bird PArk and Falls. Thats the best part about this hotel. The spa was good. The staff was nice and helpful. As you can read on many review forums, the reception is pure chaos. They never know which room to give you and they never give you the room you have booked. But these days they have come up with the "smart" idea that they have "upgraded" you. We were all "upgraded"! My upgraded room: two tiny, uncomfortable twin beds (I booked a double) in an old room with depressing furniture. The food is worse than I had read about. As suggested by many travellers, I avoided the buffet and ordered a la carte. Nothing to do. The food is just crap. No matter how many bad reviews they get, they will always have business: they are 5 mins walk from the entrance of the Iguacu Park. Just stay one night and escape. my stay was great. i have a nice room, all clean. the facilities were good: pool, nature's trail. food was great, had 2 buffet dinners. 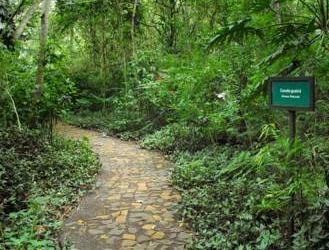 location is very good, very close to the airport and to Iguazu National Park. It was very good. The only let down was none of the staff or even reception could speak Fluent English. 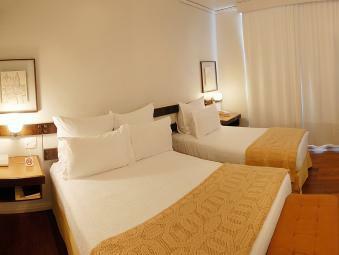 Expect more from a 4 star hotel located next to probably the most visited Tourist destination in Brazil. Room service was poor and it took 3 attempts to request and iron and board until a waiter turned up with a Menu card. At which point, I gave up and went out in crushed clothes. Service is at snail pace and not always with a smile. Then maybe I am just spoilt and this is the standard in Brazil. The room I had was clean but the bath room was dated. Beds are comfortable and common areas are clean (carpeted areas are looking tired). I would recommend this hotel for the location and it's peaceful surroundings. Will stay here again. 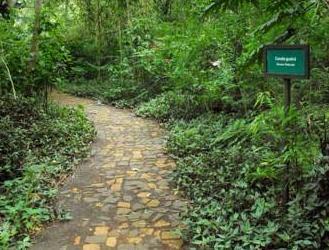 Good hotel located in a beautiful garden, swimming pool and a private jungle trail! The entrance to the Iguazu Falls (Brazilian side) is in 10 minutes walking distance. A private Bird Park is next door and highly recommended to visit. The hotel is nice, well kept, clean. The staff is friendly, helpful; English is widely spoken. The Tour office is knowledgable and helpful to explain and arrange tours. The rooms are a bit small. The only complain is the Internet connection, especially in the rooms). The breakfast offers a rich buffet. The dinner was not exciting and/or cheap. good place for a short staying to visit Iguacu national Park. rooms are clean, comfortable. service is good , especially at the lobby. The hotel is within walking distance to Foz Iguacu. The room condition is good. However, the restaurants are not up to standard and very pricey. We experienced a blackout during our stay. There is a tour desk at the lobby. Very far away from town. 1.The front desk staff were so irresponsible and rude. Bad experience we ever have. 2. Taste of food inside the only restaurant of the hotel is really not good. The waiters would ask customers for tips in cash. That's fine but a bit strange. 3. Super slow wifi. 4. Beware of insects inside the room. Some high and lows on this hotel. See which are more important to you to help inform your booking, or not. PlusPoints - walk to the entrance of the Falls (Brazil side), helicopter flight over the Falls and Bird Park (all which were brilliant by the way) - local bus stops outside - close to Brazil Iguazu airport - hotel, room and grounds really spacious and clean - didn't experience the rudeness we'd read from others from the hotel staff. Plenty of smiles all round - the pool was inviting after a day doing the sights. LowPoints - Hotel food. Breakfast choice limited. Dinner poor. Set buffet priced at 50 Reals which wasn't great but only what you get a la carte at a higher price. Bland but nothing else on offer nearby. - bar closes at 11.30pm. Hotel in shutdown by midnight and the city is a fair drive away to party. For the price we paid in high season through Agoda.com we couldn't fault the value compared to what else was on offer. "